Tonight Hubby and I got sick of tripping over things in the playroom and helped the boys get it cleaned up. It would be so nice if they could actually clean it themselves, but I can understand how such a huge mess would be daunting for little kids. I remember when I was young and my mom would tell me to clean my room and I would just look around and not know where to start. Big messes look even bigger to small kids, so when you tell them to "go clean up" they get overwhelmed. Anyway, working all together it took about half an hour. It was so trashed that you'd think we'd need industrial supplies to clean it up, but we just shoveled everything into a big pile and started sorting the toys into their respective bins and drawers. The boys were a bit more helpful than they usually are when we clean it up, so that was nice. What would be even more helpful is if they didn't make such a big mess in the first place lol. Win a $30 Kroger Gift Card! I have been trying hard to save money on groceries lately by using coupons and shopping sales. Thanks to a tip from my friend Melissa, I've been going to www.pinchingyourpennies.com to find all the great deals that the great people there have found. I print off some coupons online and on Saturdays I pick up the Sunday Preview papers at WalMart- just $2 for 2 papers with all the coupons and ads that the regular Sunday paper has. I used to hardly ever shop at Albertson's or Smith's but I've found that when they have good sales I can often find coupons to get even better deals, plus when they have sales that offer money back towards your next order it's even better. Now Melissa is having a giveaway on her blog for a $30 gift card to Kroger stores (like our local Smith's). This would be so great in helping me save money. Check it out! I don't watch a lot of TV anymore. Ever since we got rid of our satellite service there's just not a lot on that interests me. We watch the Futurama episodes I got Hubby for his birthday, but during the day the TV is not on very often. I don't really miss it. I don't have to sit through boring, stupid commercials anymore. Like the dumb googly-eyed money Geico commercials. I do like most of the Progressive auto insurance quote commercials though. But anyway, yeah not really missing much. We still get all the local broadcast channels which is plenty. And we'll still be able to watch football this season, so that's good. The only thing I do miss is my DVR. I loved being able to record shows to watch when I had time. And we can't figure out how to get our VCR to record shows. Oh well, I'll get over it. Last week I was in a building that was built before light bulbs were invented and I was admiring the craftsmanship and gorgeous chandeliers. I then realized that when it was built they wouldn't have had electric chandeliers and was wondering if they had candle sconces in place of where the light bulbs go now, or some other way of lighting the room. Makes me realize that electric lights really are pretty cool, lighting up rooms so well and allowing us to do things past nightfall. I also thought it was cool the intricate workmanship and massive projects they did without modern machinery. Pretty awe-inspiring. Well, looks like our family will be getting more members. No, not from me lol. One of our cats is pregnant. I've been putting off getting them fixed since they are indoor cats, but since the boys go in and out all summer, they've gotten out occasionally. Long story short, in about a month we'll have a litter of little fuzzballs. I wish I knew exactly when, but since cats don't get morning sickness or need acne treatment when they are pregnant I only realized it when her belly got round enough to notice. I'm just assuming she has about a month left, since I think the last time our other cat had kittens she had them about a month after her belly was noticeable. And of course I will post pics of the little cuties when they arrive. I'm interested to see what they look like since I don't know what the father looks like. I know, it's been too long again. If I spent the time blogging that I spend playing games on Facebook I'd have posts up every day lol. I'm sure I have tons to post about. In fact we've acquired a new addition to our family that I need to post about. Guess I'll do that now while I'm thinking of it. This weekend we went up to Idaho for a family reunion (Hubby's family). Silly me didn't think to check the weather forecast, so we got up to the campground Friday night and it was freezing! Since we've had weather in the 90s for weeks I was not prepared. We had no sweaters or jackets or anything. Brr! It was a relief to go to bed and snuggle into our warm sleeping bags. I didn't sleep very well, even though I had the only non-leaking air mattress lol. It is not comfortable to share a sleeping bag with a teething baby who wakes up every hour. But at least we had a delicious breakfast cooked over the fire in the morning. We had the family potluck and stuff in the afternoon and it was lots of fun and lots of good food. And here comes the part about our new family member. Hubby has an aunt whose dog fathered a bunch of puppies that she needed to find homes for, so she brought them up to the campground. She managed to find homes for them all, one of them with us. I'm not sure what I was thinking lol. We had promised Jason last year that we'd get him a puppy when he turned 5, and that is next month. 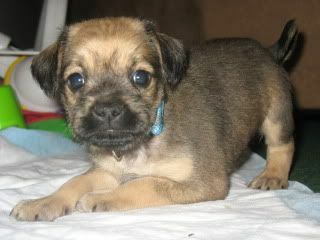 The puppy is a Pug-Schnauzer mix, so he will stay small and should be a good family dog. Oh, and we named him Sam to go along with our other America-themed animals- Stars, Stripes, Colors, and now Sam (as in Uncle Sam). This morning we got up and got ready for church and I once again wished I had one of those cute tie or tuxedo shirts that they sale for babies, the ones that are a onesie with a picture of a tie or suit on them, I think they are so cute. Anyway, while getting ready we remembered that we needed to meet with our bishop today so we only stayed for the first meeting and then headed home. All in all it was a good weekend, just exhausting. And now I get to learn how to housetrain a puppy, eek!